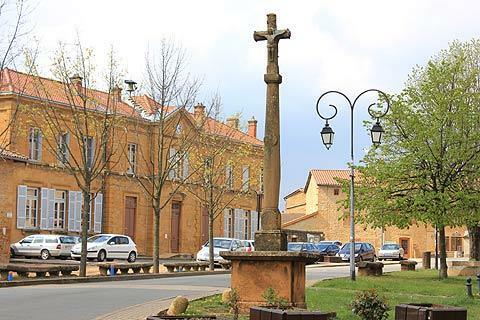 Bagnols is a small village in the heart of the Beaujolais countryside. It is in the Rhone department of the Rhone-Alpes region. France This Way comment: it is true that Bagnols is a small village that does not take long to explore, but it makes a charming place for a stroll when you are touring the Beaujolais region. Historically the village grew up around the main trades of wine-making and stone-cutting as a result of the vines and the quarries in the neighbourhood. 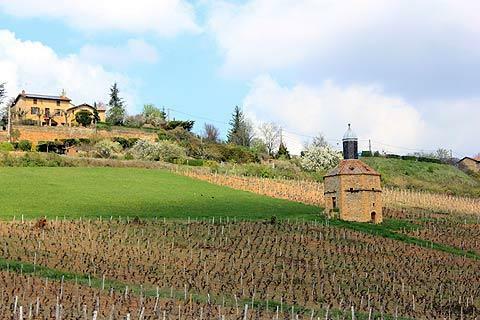 The quarries have closed now but wine making is still an important industry and Bagnols is surrounded by vines used to make the lovely Beaujolais wines of the region. Bagnols is a beautiful little village with an attractive church and a castle in the centre. The main square, called the Place du Chateau, has the Chateau running along its lower edge and the village Mairie on one side. 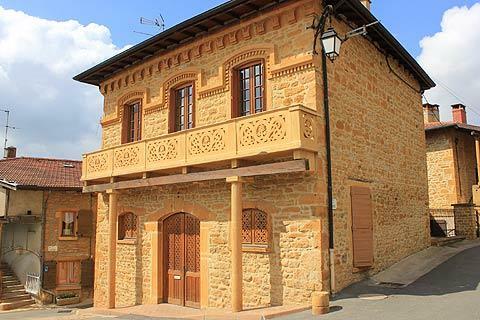 These as well as all the other buildings in the village are built in a beautiful golden stone which comes from the quarries just above the village. There is a large stone cross on the square which was erected during the reign of the Emperor Napolean (1804). A small bar/restaurant on the square gives you the chance to relax and take in your surroundings. At the top of the village is a church which was built in the 15th century. The church windows have a very pale stained glass giving the interior a very light and airy atmosphere. 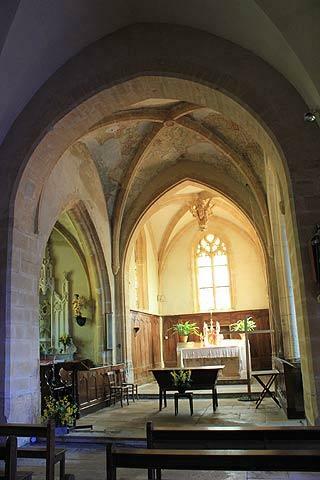 It is very unusual but makes a pleasant change from the darker interiors more common in churches. 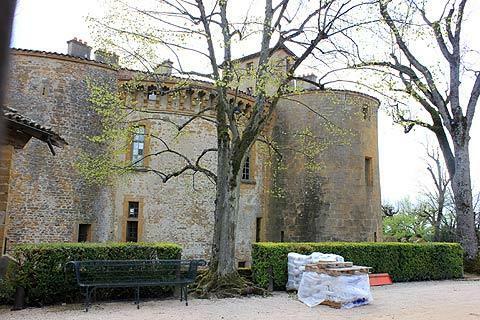 Bagnols chateau dates from the 13th century and has a wonderful Renaissance mantelpiece carved with the Arms of France for a visit by King Charles VIII. The castle has been renovated and restored by an English couple, Peter and Helen Hamlyn, and is now a luxurious hotel decorated with fabulous period furniture and surrounded by attractive French-style gardens. Famous guests include Tom Cruise and Nicole Kidman, Bruce Willis and the rock group 'The Cure' and is part of the Small Luxury Hotels group. The best way to admire the castle is to stay there! See here for photos and bookings. In the local area there are a number of small round buildings made of stone called bories. The best examples are at nearby Theizé. Another pretty village to explore close to Bagnols is at Oingt, now listed among the 'most beautiful villages of France'. 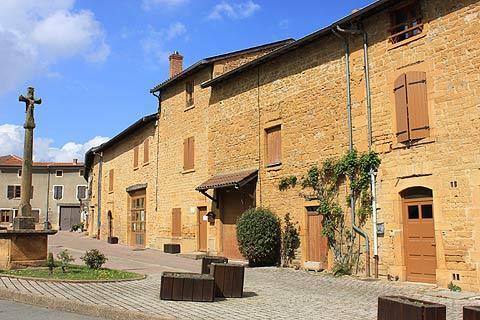 The village is set in the Beaujolais countryside and so there are plentiful opportunities for wine tasting and buying in the area.